The following manual was released by the Department of Defense on August 11, 2016. The manual was first reported on by Steven Aftergood of the Federation of American Scientists. o Assigns responsibilities and establishes procedures for Defense Support of Civil Authorities (DSCA). o Identifies authorities for DoD Components to provide support of civil authorities and non-DoD entities. For DoD support described in this manual that is not under the oversight of the Assistant Secretary of Defense for Homeland Defense and Global Security (ASD(HD&GS)), this manual identifies the offices of responsibility and oversight. •This volume provides a general overview of DSCA. 3.1. DoD has capabilities and resources to defend the United States and fight its wars. These capabilities and resources are also well-suited to support civil authorities and other non-DoD entities. DSCA, in general, is in response to a request for assistance from civil authorities for domestic emergencies, law enforcement agency support, and other domestic activities. The most visible support is provided during major natural and man-made disasters and other incidents (see Section 4 of Volume 2 of this manual). However, DoD also frequently provides support to a wide range of non-DoD entities. 3.2. 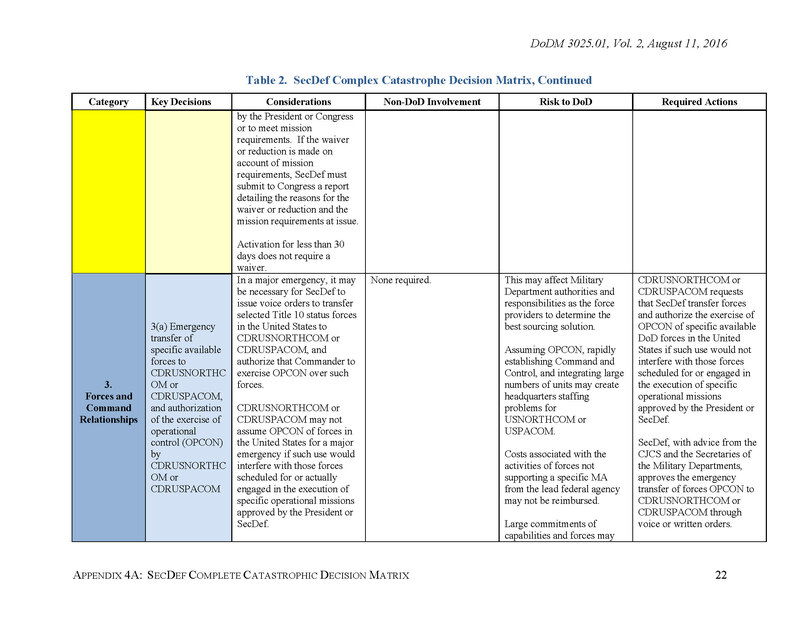 A key factor in determining whether DoD should provide support of non-DoD entities is identifying the authority that directs or allows the support. U.S. law, Presidential Executive Orders and directives, federal regulations, and DoD policies provide the framework and authorities for DoD to provide support of non-DoD entities. 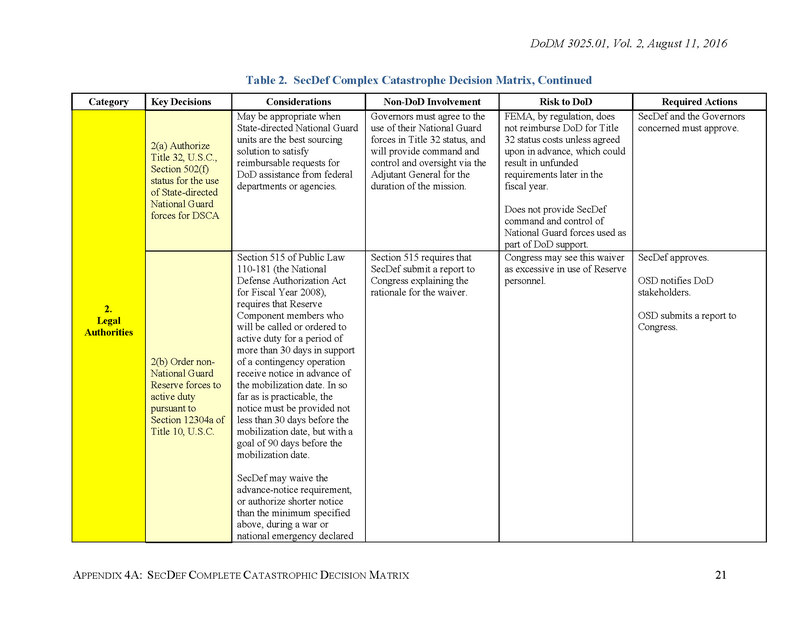 A number of the DoD Components (e.g., the Defense Agencies) have specific authorities and appropriations to provide support of non-DoD entities. 3.3. 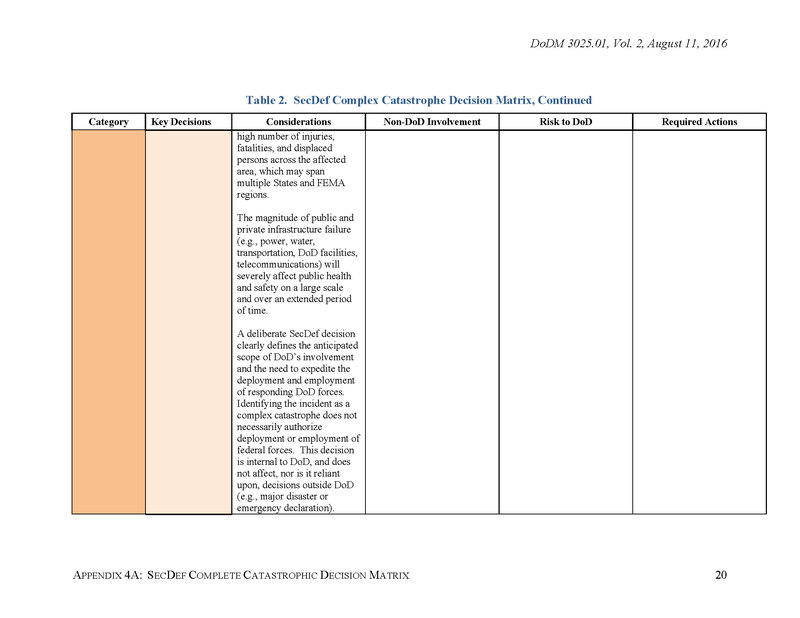 Within DoD, authorities are often delegated from the Secretary of Defense to DoD Component heads through vehicles such as DoD issuances, memorandums, and Secretary of Defense-approved standing Execute Orders (EXORDs) (see Section 5 of this volume for DSCA-related EXORDs). Responsibilities also may be reflected in memorandums of agreement (MOAs) (see Section 4 of this volume for information on MOAs). 3.4. 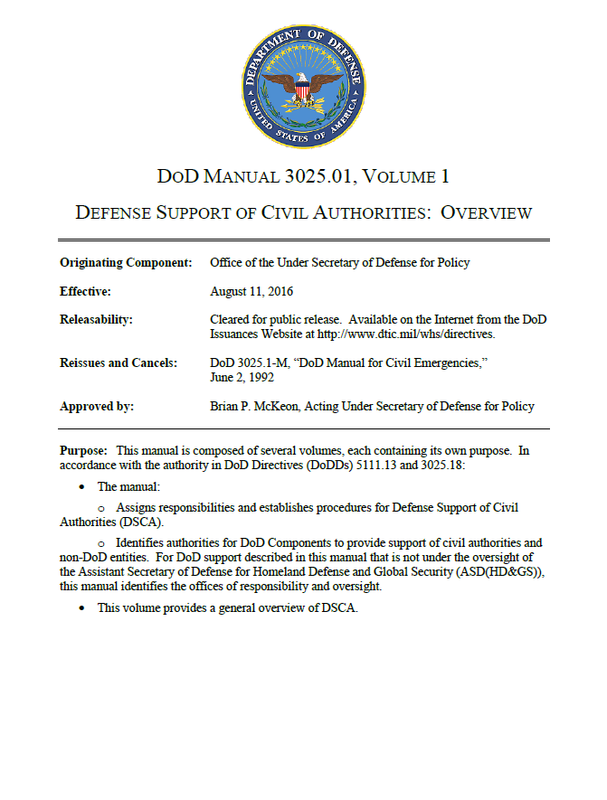 In accordance with the authority in DoDD 3025.18, DoD officials have immediate response authority to requests from civil authorities in an emergency to save lives, prevent human suffering, or mitigate great property damage. Immediate response authority should be used only in incidents where consequences are so severe or imminent that there is not enough time for the normal request for DoD assistance processes to work and the situation requires immediate action. See Section 5 of Volume 2 of this manual for detailed information regarding immediate response authority. 3.5. In accordance with DoDD 5100.01, some common Service functions are to organize, train, and equip forces and to provide forces in response to requests for support of civil authorities in the United States, including support for disaster relief, consequence management, mass migration, disease eradication, law enforcement, counter-narcotics, critical infrastructure protection, and response to terrorist attack. 1. 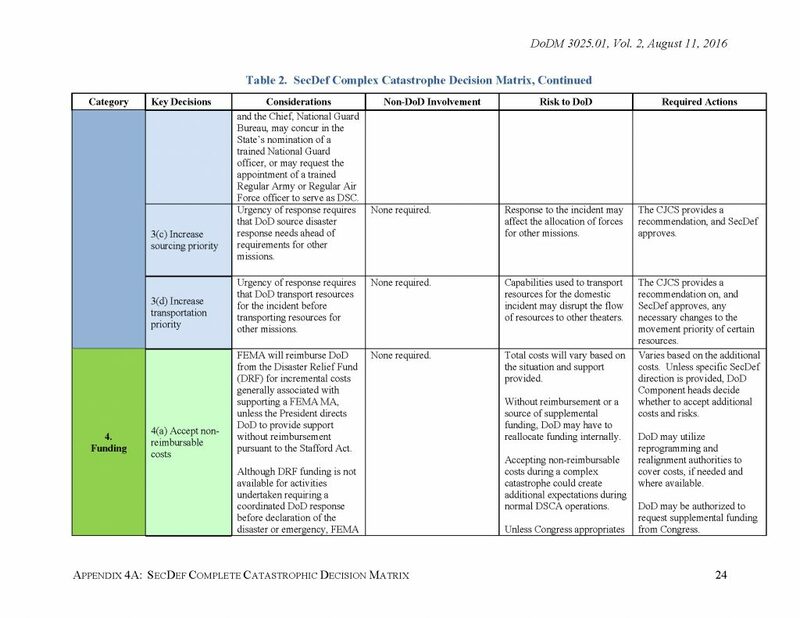 The matrix at Table 2 describes decisions that may be required before or during a complex catastrophe and the effects and risks of those decisions. Decisions that SecDef has delegated to others or made through DoD issuances, EXORDs, or other authoritative guidance documents are not included. 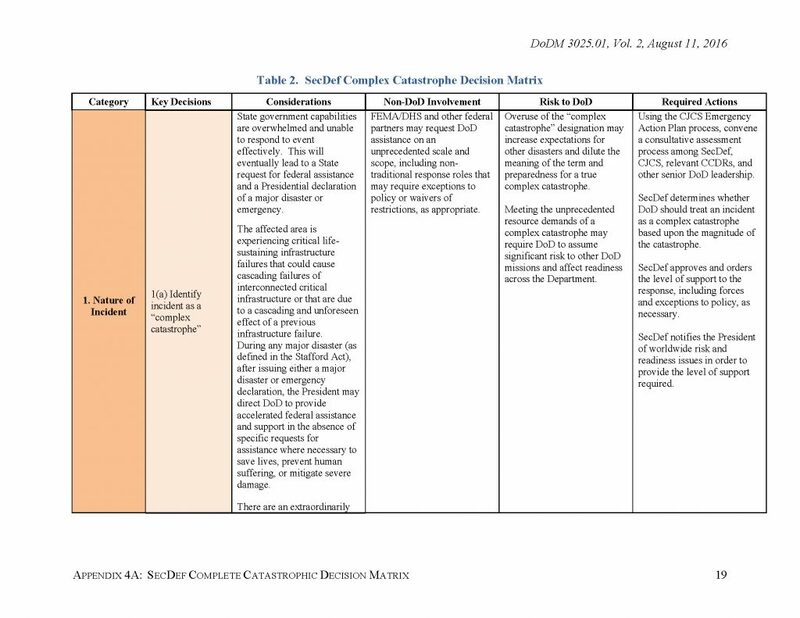 This matrix does not prescribe new policy, but rather provides senior DoD leaders and their staffs with a shared understanding of likely and known decision points. 2. 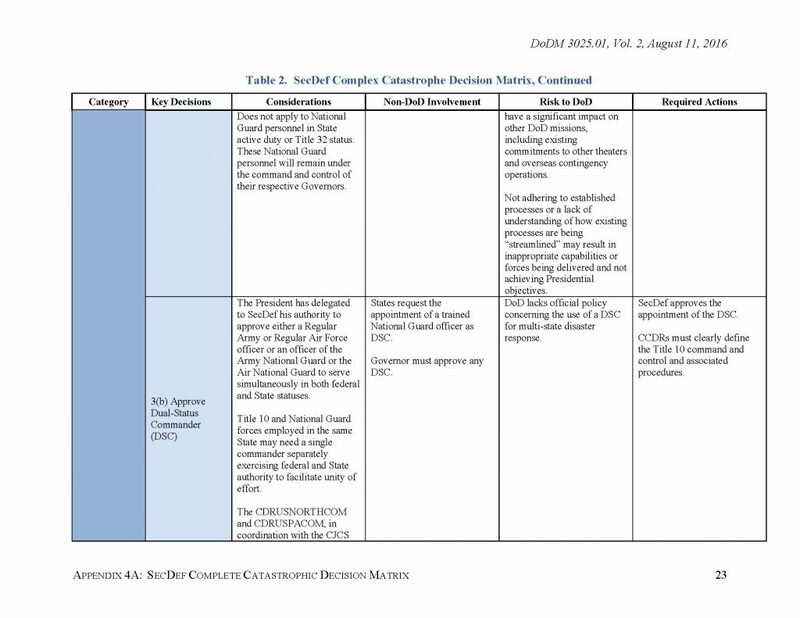 The decision matrix is also a useful tool during other domestic incidents that do not rise to the level of complex catastrophe. SecDef may make various decisions as requirements and stresses on DoD change over time and the scope of the incident becomes more apparent. 3. 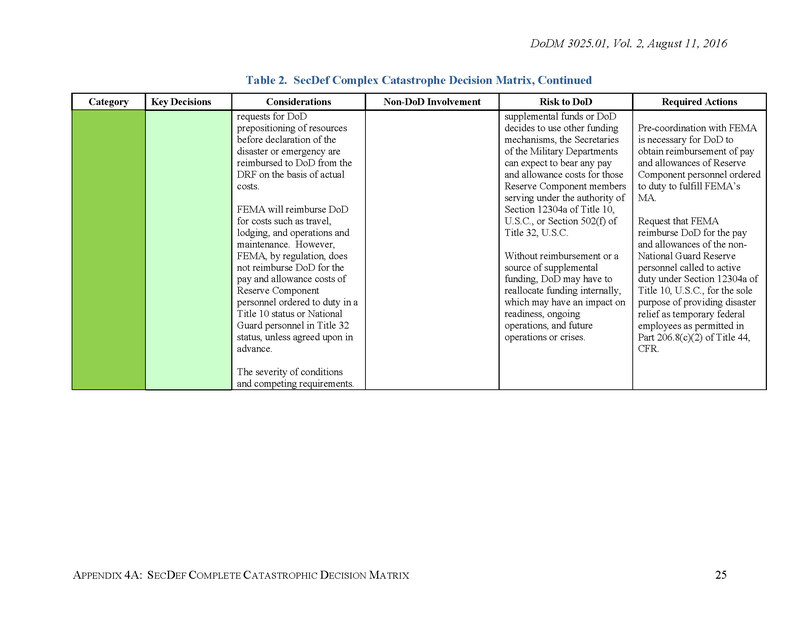 The decision matrix is colored orange for geo-political considerations of an incident, yellow for legal authorities associated with employing DoD capabilities, blue for forces and command relationships, and green for funding considerations.